Right now we are waiting for new David FARREN Architectural Art to arrive at the gallery. In the meantime, here is a wider selection of the artist's work featured at the Red Rag Modern Gallery. David Farren was born in 1972 in Wiltshire. He considers himself mainly self-taught although he did complete an art foundation at the University of the West of England in Bristol followed by a short period studying fine art. David uses expressive brushwork and colour to represent the energy and movement of the urban landscape, providing a snapshot of everyday life. His aim is to capture the ambience and individuality of some of the world's most exciting cities from a street level, concentrating on the people as they go about their daily lives. 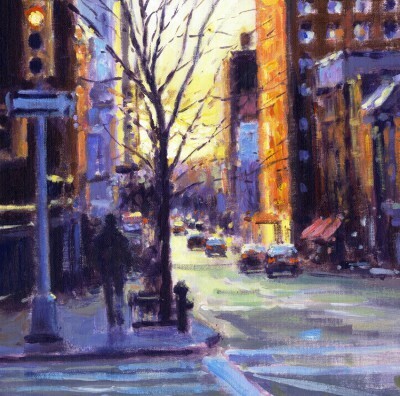 "Since visiting New York for the first time in 2000, I have found a real passion for depicting urban day-to-day scenes and trying to capture the energy and drama of city life. I was overwhelmed by its scale and vibrancy and have returned several times since to express the different moods of the city in paint. I also have a great fondness for European cities with their mixture of old and new architecture. I like to concentrate on the people as they go about their everyday business and try to capture moments of everyday life." Farren produces high-impact paintings in acrylic and oils. David enjoys the immediacy and versatility of both mediums which he finds particularly well-suited to his direct, impressionistic and expressive style of painting. He is fascinated by the changing seasons and how the varied light affects a scene, and his distinctive use of colour is an essential part of reflecting this. David also enjoys painting landscapes and finds inspiration in the nearby Lake District and Yorkshire Dales, as well as from his travels abroad. David Farren has exhibited widely across the UK with great success and, as well as exhibiting at Red Rag Gallery his paintings have also been shown at other leading British Art Galleries. His accomplished and atmospheric paintings can be found in collections across Europe and America.